Do you think the chihuahua ever wants to bulk up and look like a mastiff? Maybe, but it achieves that through attitude. Does a greyhound ever want to be a pitbull? I doubt it. It just does what it does best and runs really fast for short stretches of time. Why don’t we do what the animal kingdom does so well? Why don’t we celebrate our strengths more? Why are we constantly trying to all look the same, be the same, and achieve the same? Why can’t we be happy setting our own goals and achieving them for ourselves? It’s o.k. to strive to achieve something if you’re doing it from a place in your mind that is healthy for you and because you want to for you. Not just because you feel like you should or you have to or because all the cool kids are doing it. You do you. Screw the rest of the people. I’m learning to do that this year. It’s going o.k. Wiping out a lifetime of mental beatings is rough but I’m getting there. 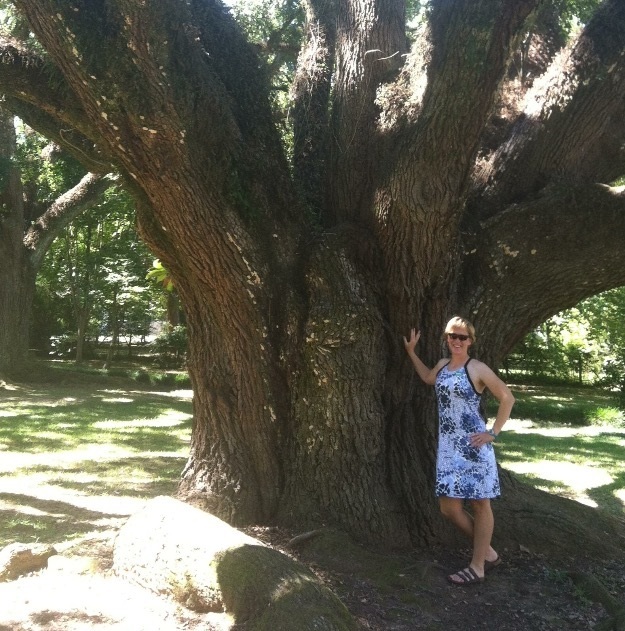 The opening picture is me in front of a very large tree on a southern plantation in Louisiana about 5-6 years ago. It was a work trip and I had built in a couple days to sightsee a little of the south while I was there. I remember that day because it was hot and humid, of course, and I had to have “bike shorts” under my sundress to keep my thighs from rubbing together and chafing miserably. I was so ashamed of myself for having thighs that rub together. I’m a runner! I should look like those gazelles at the races I ran! Now, I see that picture and I love it because I loved that little road trip and loved wearing my sundress. What I’ve learned is I’m not meant to be a skinny leg gazelle. Even once I achieve a better weight for myself, I’m curvy. I’ll never be a runner at the start line without my curves. At some point early this winter I realized that I can embrace my aging image and be the best version of myself I can be. Striving to achieve the ignorant ideal images society pushes on women is no longer a part of my life. I wish it never had been. I really did kick the diet industry with its disordered eating messages and fat shaming right the hell out of my life. Good riddance. I am just now learning how to take a step back and really think about what I want to do and what makes me happy. It’s hard because it’s so different than what makes many people happy. This is the beauty of the community at LHRL. I have found many people like me that embrace the trails. The mud, the bugs, the ankle bending single track, the roots, the rocks, the glory of nature. But we love all the sports at LHRL. If you want to do it, we got your back and we’re cheering for you. We aren’t just about lifting and running. Swim, bike, paddle, ski, walk, hike, Oly lifting, crossfitting, bodyweight training – we love it all! Are you working to achieve a goal that isn’t true to yourself? Have you thought about the goals you’re trying to achieve and are they yours or what your friends have convinced you to achieve or what society is telling you to achieve? Love this! It is so hard to erase what we’ve been taught since childhood and reprogram our thinking. You are so right. It’s taking a lot of mental effort to move forward without things from the past creeping in and clouding my head space.